Fireline! Love it or Hate it? As I sit down to stitch beadwork, I have a choice to make with my thread. K.O., Sono, One-G are my favorites, though Nymo is always a great backup. I hardly ever use Fireline. Ugh. But, read on to discover how I changed the way I think about my thread choices. 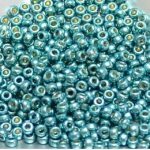 We beaders are very choosy about the materials we work with. 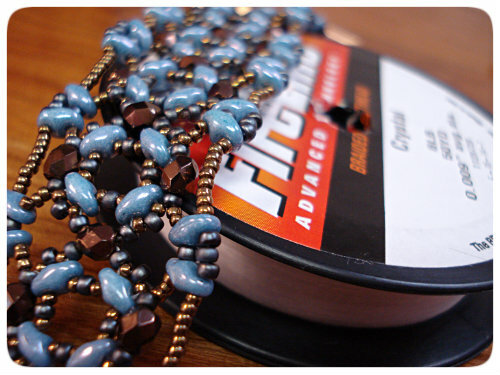 Because we are tactile people, the feel of the beads and materials we use is as important as how they perform. If it doesn’t feel good to work with, we won’t use it! That has been the primary reason I have steered clear of Fireline. I just don’t like how it feels when I work with it. It’s stiff. It’s got texture I can feel. It doesn’t have any give. But, all these things that bother me are actually why the projects themselves sometimes demand it! I was just in a situation where I was stitching a project and HAD to use Fireline. OK, so I used it. For this project, I had to agree it was a great choice. So, I am giving it a second chance and finding it is great to use where a certain amount of stiffness is helpful, in smaller projects where I’m not using long lengths or tying on new threads, and patterns where the doggone beads are just too slippery to stay where I want them to go no matter how much wax I use. The result of my giving it a try? While it will never feel as silky as K.O. from Japan, it is growing on me the more I use it, and I will continue to choose it when it’s called for. Now, go bead something, and try some Fireline if you haven’t before!